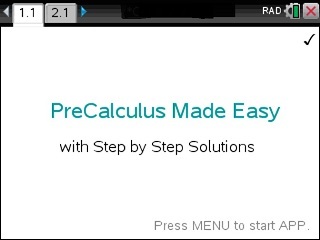 The most comprehensive PreCalculus APP for calculators. Users have boosted knowledge & grades. Ideal for quick review in all PreCalculus areas such as Functions (Polynomial, Exponential, Logarithmic and Trigonometric Functions), Trigonometry, Statistics, Discrete Mathematics, Algebra, Matrices, Complex Numbers, Sequences, Introductory Calculus.